World's most-loved doughnut chain, Krispy Kreme will be celebrating its 75th year of confectionery goodness this coming July 2012. In line with the celebration, Krispy Kreme will open new branches, share giveaways and introduce new creations even before July arrives. Tomorrow, Krispy Kreme Philippines will officially open their 3rd branch in the Queen City of the South. This event is a record-breaker as this is the very first time wherein the company opens 3 branches in one city within a couple of months. The new branch is located at the upper ground floor of SM City Cebu. It is beside Starbucks Coffee and across Goldilocks. SM City Cebu is located at North Reclamation Area, 6000 Cebu City, Philippines. What makes the opening of Krispy Kreme's 3rd branch in Cebu City is the Golden Ticket. For the unfamiliar, Golden ticket is no ticket made out of Gold. It is a ticket exclusively distributed by Krispy Kreme which entitles the holder/owner a year supply of doughnuts and coffee. On May 18, 2012, by the moment the clock strikes 10:00 in the morning, SM City Cebu will open its gates to costumers. The first costumer of Krispy Kreme SM City Cebu will get the one and only Golden Ticket. Not only will there be a gift for the first costumer of Krispy Kreme SM City Cebu but also the 2nd to the 75th costumer. 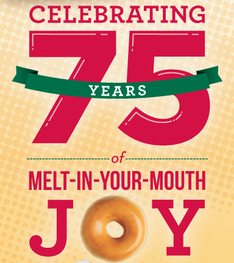 4th to75th person to purchase one dozen of Krispy Kreme Doughnuts – receives a month supply of Krispy Kreme Doughnuts. Sounds exciting, right? These information you're reading right now were just announced a few hours ago to selected Cebu-based bloggers and media. You're lucky you read this post so be early tomorrow, okay?